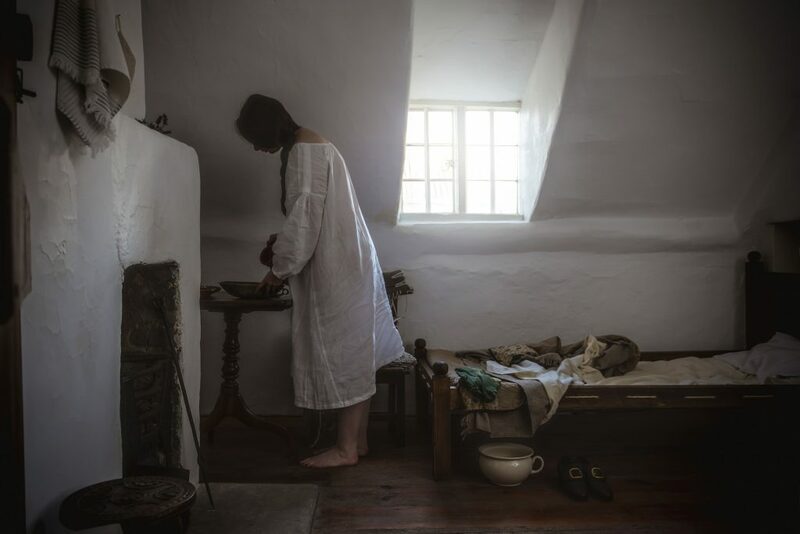 Crow’s Eye Productions has just completed a follow-up to our film ‘Getting Dressed in the 18th Century’ that we made for Lady Lever Art Gallery. The immense popularity of the first film raised the question amongst the audience who viewed it and enjoyed the complexity of a wealthy woman’s dress: ‘who dressed the maid’? So we made the second film to explain in detail how dress was simplified by working women, and made more practical and affordable, while still maintaining the fashionable silhouette. As with the first film, this was devised, directed, filmed and edited by Nic Loven, and researched and costumed by Pauline Loven. 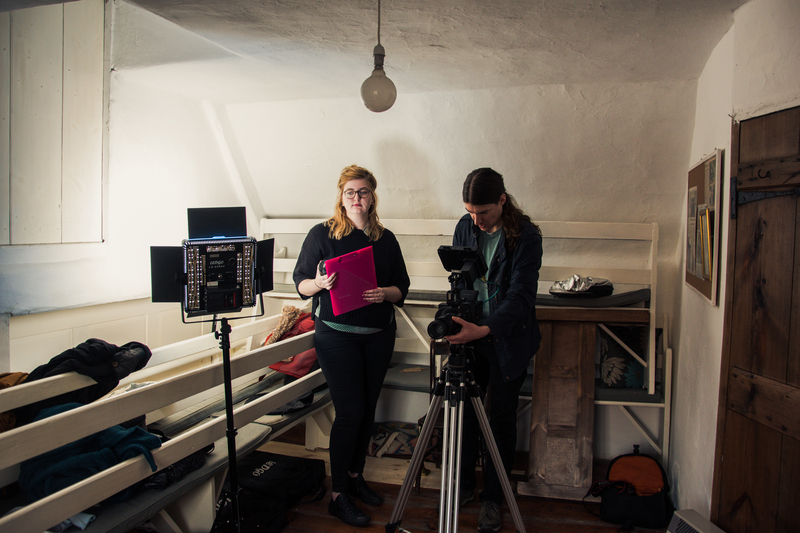 Nic Loven, Director, with Lilli Stoddart, assistant producer. Photo © Keith Loven. 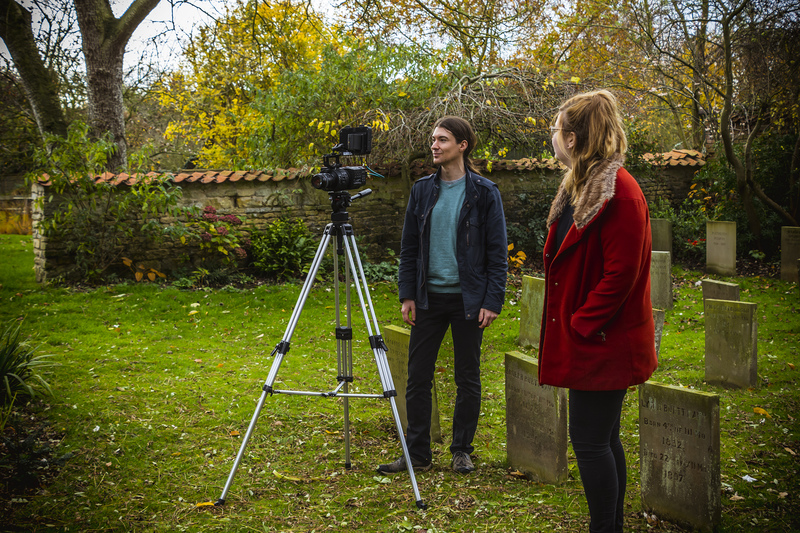 Our first task was to find a suitable location to film in, but we already knew of an almost unaltered chamber (bedroom) of a one-up one-down 18th century cottage, now part of the Friends Meeting House in Brant Broughton. Model, Liv Free. Photo (c) Pauline Loven. The cottage and attached barn had been donated to The Friends in 1701 and, apart from minor alterations to turn the barn into a Meeting House and subsequently to put in power and heating, the core of the building was maintained unaltered. The fireplaces, floors, doors (with original blacksmith door furnishings), walls and windows remained as they had been in 1701. Even the original cloak pegs were in place. The only problems filming were the small area we had to work in and the fact that the original prayer benches had to be stacked to one side of the room. We chose our model, Liv Free, for her natural English rose looks, but to her surprise and ours she turned out to live in the next village and so it was perhaps her easiest ever commute to a modelling job! Not only is Liv a beautiful model and hair and makeup artist, but she also has also created a line of extraordinary and opulent accessories, including headpieces and masks (though we didn’t need any for this shoot!). Our Voice Over Artist, Martha Milne, is an American who has lived in Lincolnshire for many years. She has been a long term collaborator with Nic Loven and Crow’s Eye Productions. 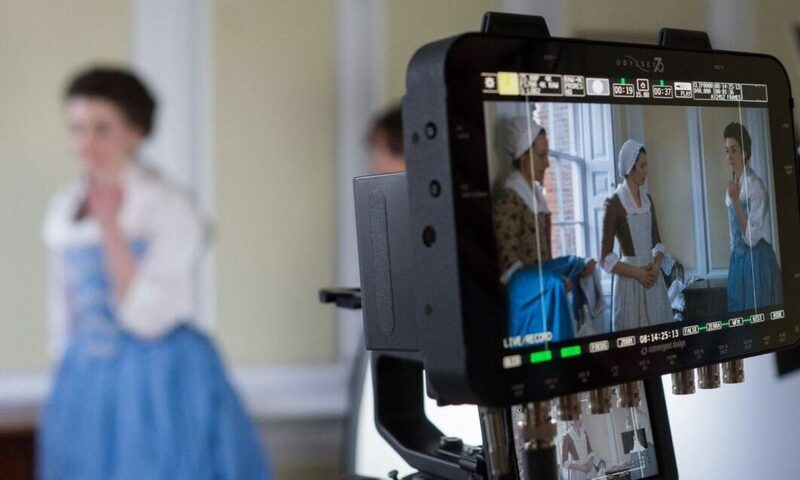 The script was researched and written by our period costumier Pauline Loven and edited by Martha Milne. 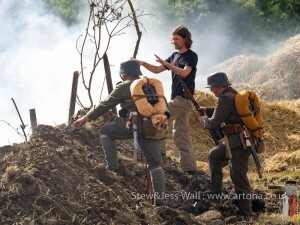 Pauline also created the costumes and produced the film. 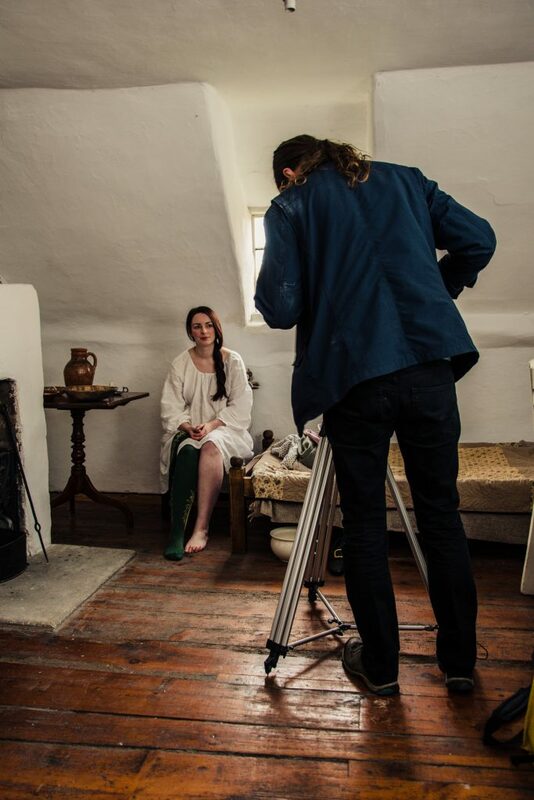 The film was made on the tiniest of budgets – even the replica period pottery was loaned to us (by Andrew MacDonald from the Pot Shop in Lincoln), and the bed was made at cost by carpenter Peter Halse. So a huge thank you to everyone who made this possible! Special thanks to the Friends for permission to use the Meeting House and to Wendy Gwatkin in particular for all her support at the Meeting House and the loan of antique furniture too! Many thanks to John and Sam O’Boyle for allowing us to record their cockerel Hughie! Lady Lever Art Gallery has now commissioned us the make another film, this time on the dress of a wealthy 18th century man.